A fair amount of users held off on updating their iOS 6 devices to iOS 7 for a variety of reasons, and thus those holdouts missed out on the option to use the new iOS 7 jailbreak from Evasi0n. For those users still running iOS 6.1.3, iOS 6.1.4, and iOS 6.1.5 on their iPads, iPod touches, and iPhones, having patience has finally paid off, as a new untethered jailbreak for those elder versions of iOS has finally been released. 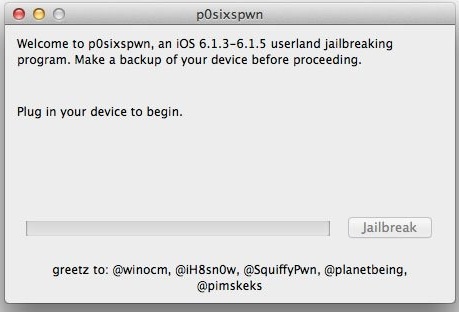 The jailbreak tool is called p0sixpwn, and it’s a free download for Mac OS X and Windows users. 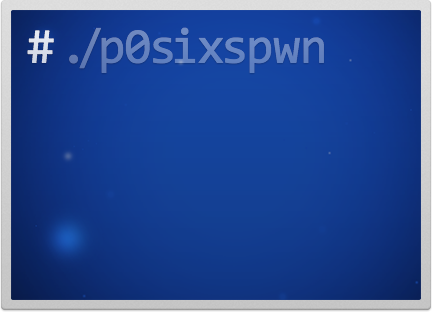 Using the p0sixpwn jailbreak is a piece of cake, with the process being very similar to that of using the evasi0n 7 tool. In fact, the two utilities look almost identical, and by following the simple onscreen instructions you’ll be through and jailbroken in short order. You will need to briefly tether the iOS device to a computer with a USB cable to complete the initial jailbreak, but once the jailbreak has completed it will be completely untethered. Keep in mind that jailbreaking is unsupported and experimental, making it best reserved for advanced users who have the appropriate knowledge and a compelling reason to jailbreak their devices. There are many reasons why it is not recommended for most users and average iPhone/iPad owners are typically advised to avoid the process. For some background, a jailbreak typically allows users to download and install unauthorized 3rd party software onto the iPad, iPhone, and iPod touch, allowing for customizations and a variety of tweaks. Jailbreaking is not the same as a carrier unlock, and thus it does not free up the ability to use an iPhone on another cellular provider. Assuming you know what you’re doing and know why you’re doing it, back up that iOS device, and have at it. Otherwise, just be happy with iOS as it is. I just find no good reason to jailbreak anymore, am I missing something? Most of my hardware is on iOS 7 now, and the iPad 3 that is running iOS 6.1.3 isn’t going to ever get updated or jailbroken. All I use it for is reading. Why bother? If it ain’t broke, don’t fix it. I kinda agree with you Mark but my only reason for jailbreaking is the cracked apps that I have collected over the years and don’t want to let go yet. I have iPad 2 and I kept it at 6.1 for the longest waiting on a jailbreak now ios 7 came out with a jailbreak and that’s why I upgraded not knowing that ios 7 jailbreak isn’t complete my cracked apps are on my iPad but blacked out and non responsive that’s why I didn’t put it on my iPhone 5. In closing as a big fan and supporter of jailbreaking I think its kinda dumb to come out with a jailbreak for a newer ios that’s so incomplete and full of bugs then turn around and make one for an older ios when most people probably have already upgraded I see that jailbreaking maybe a thing of the past in the near future but I hope Im wrong. Jailbreaking’s main goal is to fix the issues in iOS that, due to the restrictions imposed by Apple, will never be fixable, and also to open the iDevice up to much more than just apps. You know, things like f.lux, WinterBoard, iFile, that make a phone into almost a complete pocket computer. There’s hardly no reason to jailbreak right now, especially with iOS 7 and all its little bugs that beg to be fixed (and have, with many recently released tweaks). After the initial reboot of my iPhone 3GS, P0sixpwn crashes, or I should say “unexpectedly quits”. No jailbreak installed, nothing happens. Why no one help me here? I still have same issue with this!!! Thanks for reply, but no still no work the mac program is junk. I was able to do with windows on my macbook air with parallels and windows 8.
pOsixpwn couldn’t find itunes under win10 64-bit, so I tried p0sixpwn on an old macbook unibody 2007 w/2GB RAM. p0sixpwn looked promising, told me to plug in the touch, p0sixpwn detected it, and promptly complained about a lack of internet connection, and quit. I guess I’ll have to try an older windoze…?